The situation in the city of Rafah in southern Gaza at mid-afternoon Friday (U.S. CST; 11 p.m Gaza time), is both chaotic and horrifying. This posting will be updated as further reports become available. Amy Goodman’s current report on Democracy Now is broadcast from Washington and Gaza. This edition of Democracy Now, posted early Friday afternoon, runs for roughly ten minutes. The link to the program is below. It includes an on the scene set of interviews with two Palestinians, Raji Sourani, award-winning human rights lawyer, and Gaza City-based Palestinian journalist Mohammed Omer, award-winning Palestinian journalist who is originally from Rafah. The New York Times identified the missing Israeli as Second Lt. Hadar Goldin, a 23-year-old officer in an infantry brigade. He was first reported by the IDF as captured. But on Saturday, Hamas said it had no knowledge of what has happened to Lt. Goldin. Lt. Goldin’s disappearance provides Israel with its latest justification for continuing its all-out military assault on a largely civilian Gaza population, as it looks for Lt. Goldin, dead or alive. Israel always launches its military assaults with whatever rationale is currently available. This third assault in six years has thus far killed 1600 Palestinians, mostly civilians, women and children. The young Palestinian girl in the picture above is Hajar Muharram, five, shown sitting in a classroom where her family of seven now lives. Their new home is a UN school, in Beit Lahiya, in the northern Gaza Strip. The 1600 Palestinian death total since the current assault began, (63 Israeli soldiers have been killed in the same period) exceeds the death toll of the first Israeli assault on Gaza in 2008-09, when 1450 Palestinians were killed. That was the infamous assault Israel halted in time to avoid the Obama inauguration. This current 2014 assault was launched, Israel claimed, to “halt rockets from Gaza into Israel”, rockets that were largely ineffective. When the ground war began, Israel’s official rationale shifted to a “search and destroy” mission to destroy Gaza’s underground tunnels. We may assume that the latest rationale for continuing this assault against the Gaza civilian population and rejecting any further efforts at a cease fire, will involve the goal of finding Lt Goldin. Lt. Goldin was captured prior to the cease fire, scheduled to begin Friday morning (Gaza time) when Hamas militants encountered a tunnel destruction unit in southern Gaza. Israel disagrees, claiming that the capture came after the cease fire began. Lt. Goldin disappeared in the tunnel Israel was attempting to destroy. Hamas has denied any involvement in his disappearance. Dead or alive, and until more details emerge about Lt. Goldin, Israel is sticking to its own “captured narrative”. A missing IDF officer offers Israel its most compelling rationale with which to heat up its population, stir up its political, media and financial “base” in the U.S, and continue its recurring assaults on Gaza. 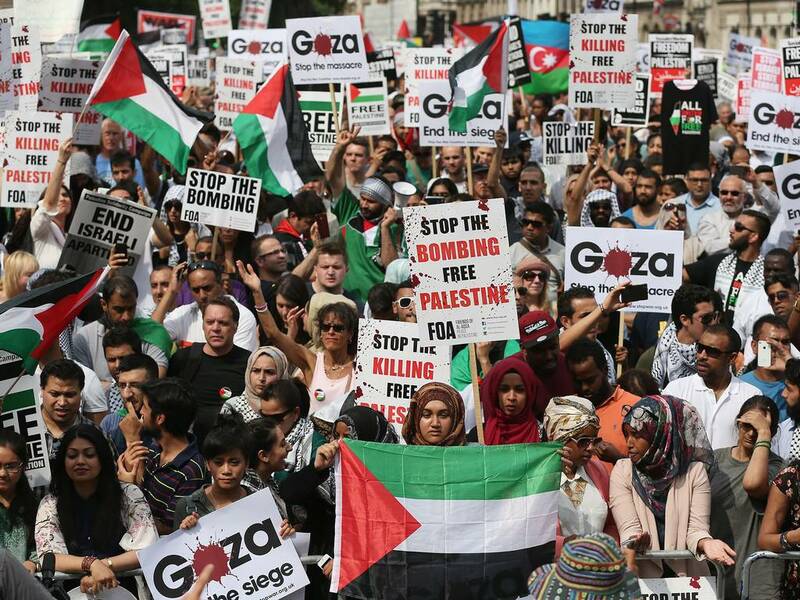 Should world public opinion, expressed in public demonstrations (like the one in London shown here with 45,000 filling the streets) finally force a “cease fire”, and perhaps more importantly, if IDF fatalities exceed a “reasonable” limit, Israel will withdraw from this round in Gaza. Until next time, of course. And there will be a next time because the real reason for Israel’s constant attacks on Gaza, and its increasingly tight control over the West Bank, is to reach its long range goal. It’s worth listening carefully when Netanyahu speaks to the Israeli people. What is going on in Palestine today is not really about Hamas. It is not about rockets. It is not about “human shields” or terrorism or tunnels. It is about Israel’s permanent control over Palestinian land and Palestinian lives. That is what Netanyahu is really saying, and that is what he now admits he has “always” talked about. It is about an unswerving, decades-long Israeli policy of denying Palestine self-determination, freedom, and sovereignty. So be prepared to hear whatever future rationale Benjamin Netanyahu uses to continue his military assaults on Gaza. Look behind the rational curtain and remember what Netanyahu told his Israeli public three days after this current assault. Israel demands control over all the land from the Jordan River to the Sea. And never forget, he will do anything he wants to maintain that control. What if other nations join those five Latin American countries and withdraw their ambassadors to Israel? Why should he care? Israel has relinquished its status as a moral nation. It knows it has the U.S. government in his back pocket. It knows the moral leadership of the U.S. still debates taking even mild actions of protest against Israel. As long as that combination of American milk toast religion and political cowardice, continues, young Palestinian girls, like the one pictured above, must fear for their lives. The picture of London supporters of the Palestinians is a Getty photo which ran in the Independent. Thanks Jim. I’m still recovering from the Senate vote 100-0 in favour of Israel’s massacres, not to mention the attitude of my Prime Minister. It begs the question of whether political advocacy is worth the effort. 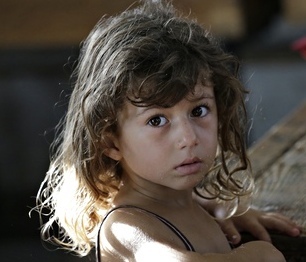 As former Vicar of Gaza, this evil is heartbreaking. Yet lighting a candle, such as your article, to destroy the darkness makes all the difference. In solidarity. Thank you, Jim. You are absolutely right. Israel’s real goal is, and has been, to permanently occupy ALL of Palestine from the River to the Sea. War criminal Netanyahu has come out of the closet and said it publicly – in Hebrew – as you mentioned. Do you remember the taunts Israeli leaders used against Arafat for allegedly saying one thing in English and another in Arabic? You have burst the “Distraction Balloons”, set off by Israel, mainly to prevent the world from focusing on the horrific casualties wrought by its “Pogrom Mower”. One day it is the unity government forged by Fateh and Hamas; then it is Hamas’s retaliatory rockets; another day it is the tunnels, and today the kidnapped soldier and “demilitarization of Gaza”, and proposing that troops be brought in to monitor Gaza’s borders. You may remember that the PLO had been calling for decades for UN, or American, troops to be brought in to monitor the borders of Palestine? Israel adamantly refused this proposal because it did not want the US to find out more about the Israeli incursions, assassinations, and games it played. Israel’s chutzpa is disgusting, as its leaders talk about “tunnels” penetrating a mile under its territory, while Israel has a few hundred settlements on top of Palestinian lands, populated with 600,000 illegal settlers. Paul’s last, so on-point sentence leads me to an observation that has been gestating in my (overwhelmed) mind for several days: The Zionist state has brazenly, in plain sight for years, sealed Gaza’s airspace, landspace and seaspace to the point where the phenomenon “claustrophobia” has taken new and ominous meaning. (Surely a close parallel exists in the illegally Occupied West Bank.) Notwithstanding that, to me in my comfort zone, digging, and then taking up posts in, a necessarily primitive tunnel would be unthinkably traumatic, who can blame a defenseless resisting force for exploiting “subterraneanspace”? After all, (i) the population of Gaza is deliberately and sadistically immiserated to the point that employment, any employment, keeps a restive, mostly young working force from idleness and provides a sense of usefulness, and (ii) people whose every breath and action are “occupied” will occupy themselves in endeavors seeking an end to the enemy’s evil ways. I harbor a suspicion that the Zionists and their fellow travelers are blowing — pun intended — these opportunistically discovered “tunnels” (I read only one reference that there are alleged to be some 30 of them) way out of proportion. But that’s nothing new: “disproportion” in all undertakings is an existential fact of life when it comes to these particular criminal psychotics and their periodic massive ventings of violence. “Israel has the right to defend itself”. Yes, it goes without saying that every country has the right to defend its OWN lands. But what Israel is actually demanding that it has the right to “defend” land it has usurped in 1967, namely, Gaza. It is like Hitler grabbing Poland and then stating that Germany has the right to defend itself from any resistance, or any rockets (no matter how ineffective) launched by the brave Polish resistance. Israel’s PR campaign of pure deception is being uncovered by the entire world, even here in America, where media is self-censored. I have finally come to the conclusion, that it is a slow, insidious genocide that Israel is accomplishing in Gaza and the rest of Palestine. The slaughter of so many civilians, including sol children, through the bombing of hospitals, UN schools and apartment buildings is proof that it’s genocide. The Israelis will lie about everything and that has been shown to be the case. their hasbara (propaganda) is better than Goebbels’, and makes him look like an amateur. This genocide has got to be recognized and ended. We need an American Dietrich Bonhoeffer, to lead the churches to stop it. He was a German pastor who stood up to the Nazis and paid for it with his life. An American pastor would not have to pay the price he did. Fred’s mention of Dietrich Bonhoeffer caught my eye in that I’m half-way through reading the 2010 biography “Bonhoeffer”. I wonder what he, who reacted so bitterly against the German Church’s pusillanimous response to the Third Reich’ s persecution of the Jews, would say about the 20th and 21st Century persecutions by the Jews.